Description: To 3.21 meters long. Snout to base of tail is up to 1.1 meters. 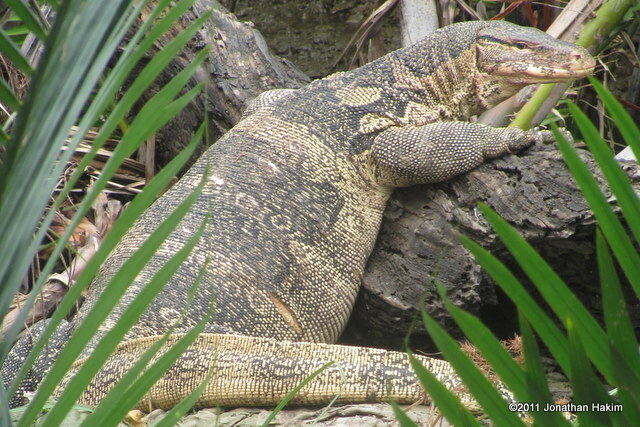 A massive, intimidating lizard, one of the largest in the world. The heaviest individuals can weigh over 50 kilograms. Body is grey to black, often with varying spots and chain patterns of yellow-to-tan that fade with age. Neck is long and head is long and somewhat flattened. Has a notably large forked tongue that it often extends to sense its environment. Tail is higher than it is wide and very strong. Underbelly is somewhat lighter than rest of body. 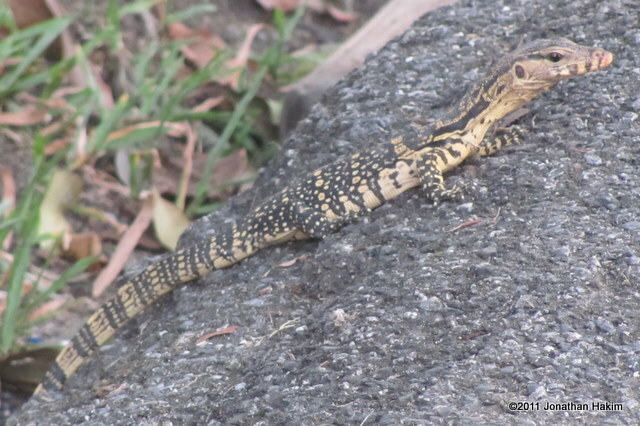 Similar Species: No other lizard in our area has the enormous size or distinct appearance of the Water Monitor. 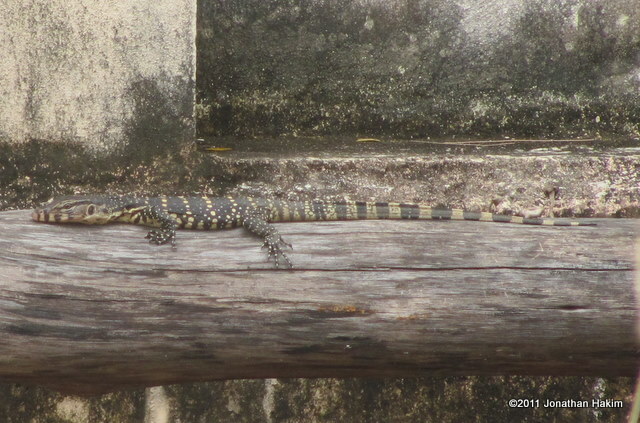 Habitat: As their name implies, Water Monitors are almost always found near water, including rivers, lakes, swamps, canals, and beaches. As long as water is available they can be seen in a wide variety of habitats, including forests, grasslands, mangrove swamps, islands, and agricultural areas. They are most common in coastal regions and become increasingly rare the further inland you go. They are very good swimmers and are known to swim long distances in the ocean, which can lead to the colonization of new islands. 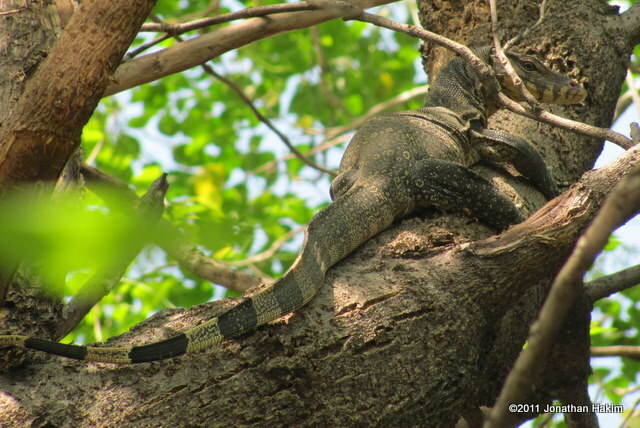 They are also good climbers and are often seen resting in trees at heights up to 10 meters. 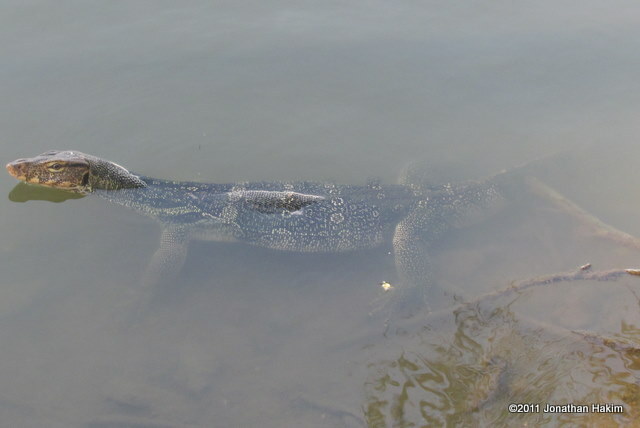 The Water Monitor has adapted well to urban environments and can often be seen in Bangkok’s parks, canals, and garbage dumps. Contribution to the ecosystem: Are an adaptable and prolific predator, helping to control insect, snail, shellfish, crab, fish, frog, snake, turtle, bird, and rodent populations. 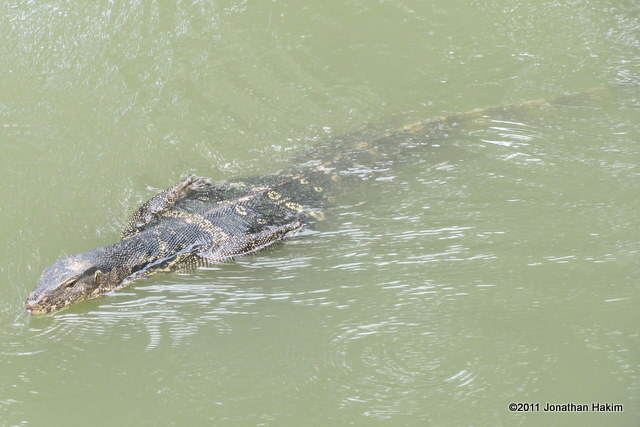 They are well-known for eating eggs, hunting for the nests of birds, turtles, and crocodiles. Monitors help keep the city clean by feeding on trash and dead meat, especially dead fish and other water animals that wash ashore. Young monitors can provide food for large snakes. 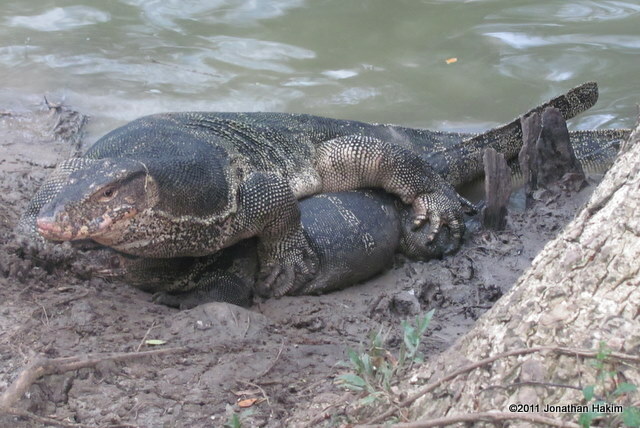 Danger to humans: Water Monitors do not prey upon humans, preferring to eat much smaller animals. 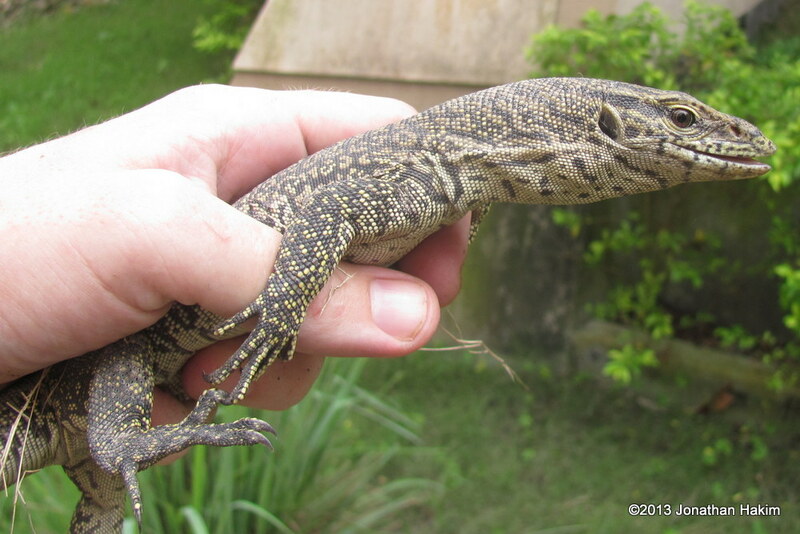 However, a Water Monitor that is grabbed or threatened by a human may use its teeth, claws, or tail to defend itself, and all three could inflict significant injury. 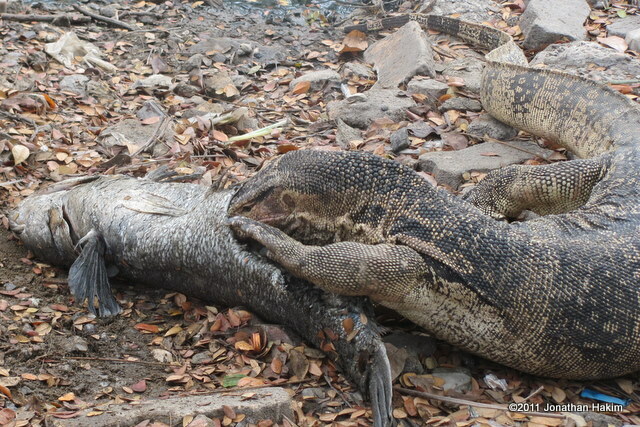 If you are bitten by a water monitor, it is important to clean the wound and apply antibiotic ointment immediately, as rotting flesh in the monitor’s mouth may lead to inflection. You should seek medical attention in the case of any serious bite in order to prevent infection. It is possible that very serious bites from the largest monitors may lead to fatalities. 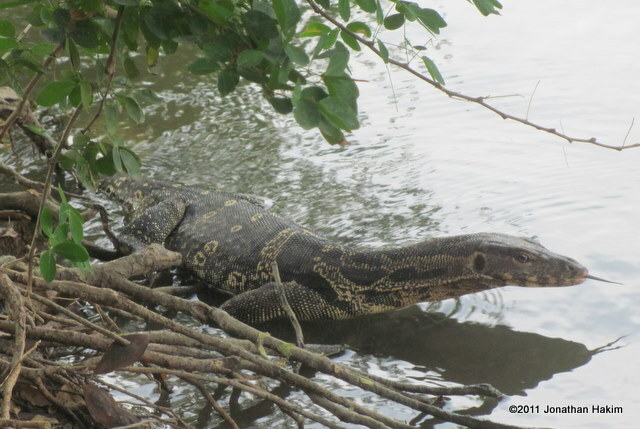 Conservation status and threats: Is a widespread and common species in Thailand. 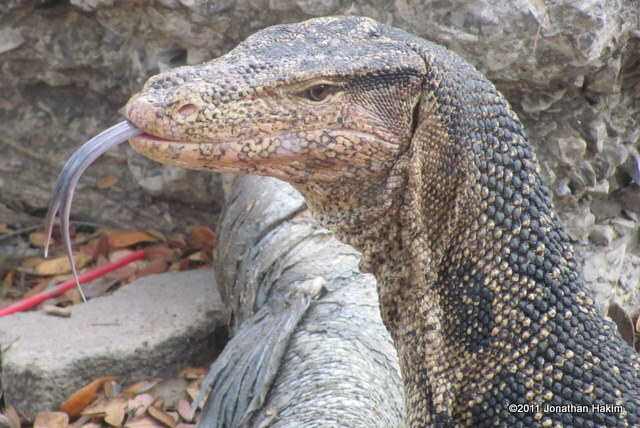 Though they are sometimes killed for sport or out of fear, they adapt surprisingly well to urban environments for such a large lizard. 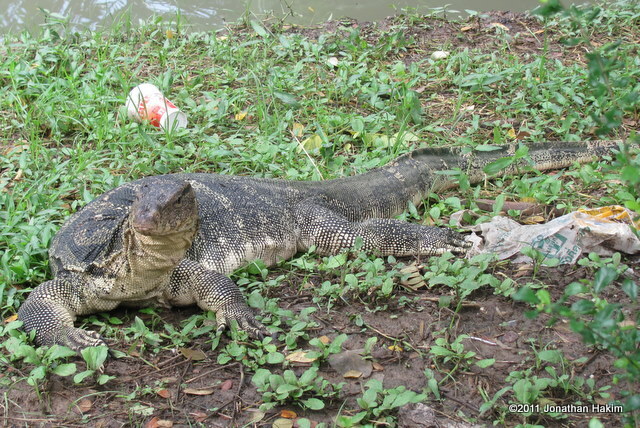 They are a protected species in Thailand. 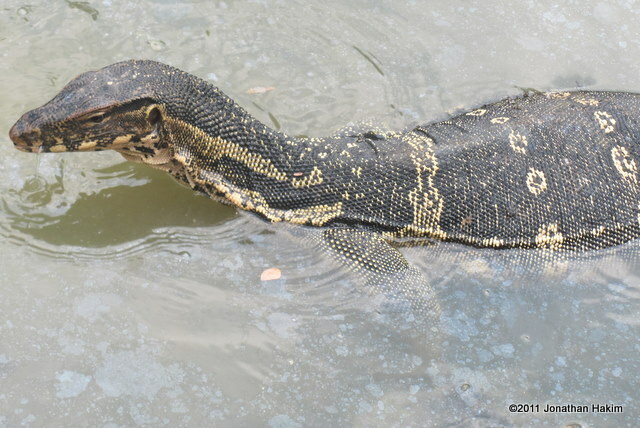 In other countries, Water Monitors face heavy hunting pressure for their meat and skins, and the combination of overhunting and habitat destruction has led to their extermination in some places. They are considered to be nearly extinct in China, and their populations have seen serious declines in India, Bangladesh, and parts of Indonesia. 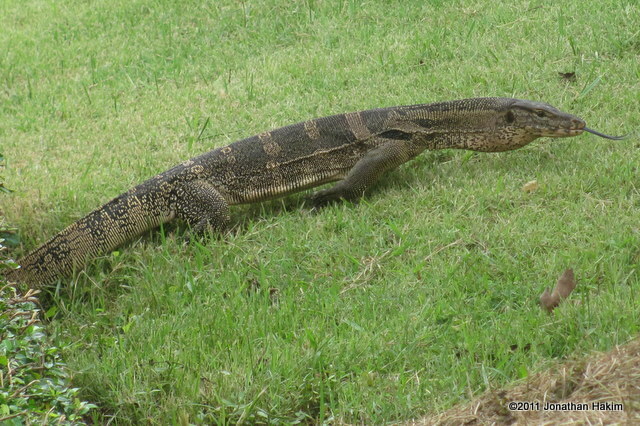 Interesting facts: The Water Monitor is an inauspicious lizard in Thailand. Its Thai name is an insult referring to an evil thing. Superstitions state that it indicates bad luck, and some Thais will even avoid saying its name. The negative connotations associated with monitors may have to do with their eating of dead animals, their feeding upon household chickens and eggs, or their frightening appearance.